Hannah Robertson has the worst schedule a 14-year-old could imagine. Most mornings she’s up at 4:15 a.m. for swim practice in her hometown of Johannesburg, South Africa. Back at practice and strength training after school every afternoon, she tumbles into bed by 7:00 p.m. With a schedule like this, she doesn’t have a lot of time for friends or fun. Yet by her own assessment, she’s a happy kid. In fact, she feels like swimming practice helps her cope with the trials of being a teenager. Hannah’s discipline and focus is paying off. She’s already number one for her age group in the junior division in South Africa. At age 13, she began competing in the senior division against much older elite swimmers and world champions and is ranked #4 there. Now she is training hard for the 2020 Tokyo Olympics. The talented middle-schooler spends her weekends studying and—you guessed it—swimming. With a schedule like that, you wonder how she has time to also practice the Transcendental Meditation technique, which she learned when she was 11. Hannah says at first she struggled to find time to practice TM, but now she closes her eyes to meditate for 10-15 minutes in the morning while her mother is driving her to school and again in the afternoon when her mom is driving her to practice. “It helps a lot with stress and helps you stay focused and concentrated, especially with a sport,” she points out. 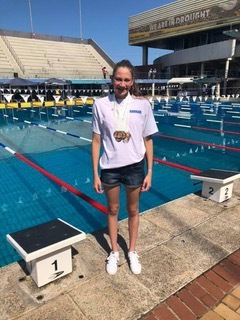 Hannah started swimming at a young age, encouraged by her mother, Amanda Hunter-Beckinsall, who coaches younger swimmers in Johannesburg. Then one day when Hannah was 10, Amanda told Hannah and her brother that she didn’t want to pressure them into doing a sport if they weren’t interested in it. Hannah’s brother chose to quit swimming, but Hannah wanted to continue. Up until then she had been working with a different coach, but at that point Hannah started working with Dean Price, and that was her turning point. Coach Dean Price has his own story to tell. “My mom was a swimming coach so from a very early age, I was around swimmers,” he says. As a young boy, he was the junior swimming champion for South Africa. And like Hannah, he was already winning in the senior national championships at age 13. But by the time he turned 18, a surprise diagnosis of muscular dystrophy ended his competitive swimming dreams. “They said there was no real treatment for it,” he says. Fortunately for Dean, someone recommended Transcendental Meditation, and what happened next was nothing short of miraculous. With his life back on track, Dean became a TM teacher at age 22, in 1982. “My medical doctors in Johannesburg couldn’t believe how powerful TM was in halting a disease for which they had no cure, and so they started sending their patients to learn TM from me,” he says. 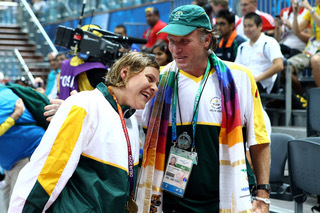 Through his club, Mandeville Dolphins, Dean coaches elite swimmers who compete in the Olympics and para-Olympics, such as Natalie du Toit, whom he worked with from 2008 to 2012. Considered the most decorated para-Olympian of all time, with 13 para-Olympic gold medals in a variety of sports, du Toit also qualified for Olympic competition, placing 14th against able-bodied swimmers in the 10 km race at the 2008 Olympics in Beijing. In 2010 she won the prestigious Laureus World Sports Award, which is often called the “Oscars” of the sporting world and has honored top athletes such as Serena Williams, Tiger Woods, and Simone Biles. In addition to all this, Dean serves his country as the High Performance Manager of Swimming South Africa, the governing body of aquatics in South Africa. In this role he works to get kids and adults all over South Africa swimming and competing. Dean says some of the swimmers he coaches are from the townships, some come from financially well-off communities. Some live outside of Johannesburg and have to be driven 60 kilometers each way to swim practice twice a day. For Dean, the “something rewarding” means offering the TM technique as part of their training. He estimates that 40 percent of his elite swimmers opt to learn TM. As we chat on Skype, he’s roaming the patio of the new TM Center he recently established in Johannesburg to teach his elite swimmers. Dean explains that TM is especially helpful to these elite athletes because for Olympic trials you only get one chance. The trials are held on one day only, at a specific time. Dean estimates that about 12 of his current elite swimmers who are training for the 2020 Olympics practice TM, including Hannah Robertson. Dean says that when his swimmers learn TM, they just want to be better in their sport and in life, and are surprised when it allows them achieve goals beyond their expectations. “Your self image improves to such an extent that you go far beyond what you ever thought you could achieve or dream to achieve,” he says. And the trust goes both ways. “I know that he’s doing the best for me and I know that he knows what he’s doing,” says Hannah. • Learn how to start the TM technique in the US here. • Find out how TM helped the Trinity College volleyball team score #1 in the US here.